Chon Buri, Thailand A fisherman caught more than he was bargaining for in the Phanat Nikhom district when his net yielded not fish, but over 50 munition items, one AK assault rifle, and a magazine of AK bullets. The items, marked with Thai registration codes. 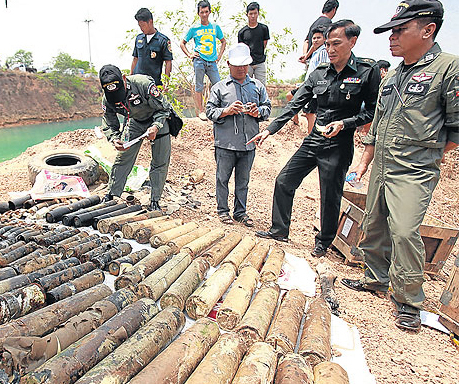 It is unknown who dumped the munitions or when they were dumped into the pond. However, the munitions were in reportedly in operational condition which indicates that they were not submerged for a long period of time. Investigator suspect that the munitions were dumped there by an anti-government group or an illegal arms dealer to avoid police at a nearby checkpoint.The munitions were turned over to authorities in Bangkok.